I'm trying to space out these Blues Brothers 7"s as I have a feeling most people who read this website probably don't care all that much about them. That being said, they are probably the single biggest musical influence I've had in my entire life, so I do want to showcase their records as I pick up these various singles. I definitely have to say, I'm surprised at how many there actually are. I also have a feeling it's going to be very difficult to hunt down the Japanese ones. This particular Soul Man 7" was released in the UK in 1990. I couldn't tell you why it was released as it was a decade past The Blues Brothers heyday, but it's interesting. The first interesting thing is it lists "Soul Man" as being from the album Best of The Blues Brothers. That is technically true, though it's certainly more well know for being from Briefcase Full of Blues. But the weirder part is they list Best of The Blues Brothers as having come out in 1978. The album actually came out in 1981. "Do You Love Me" is from the Made In America album. While not one of my absolute favorite Blues Brother songs (let's face it, there's a lot of competition for that), it's a pretty strong version of song that's certainly more well known than a lot of their covers. 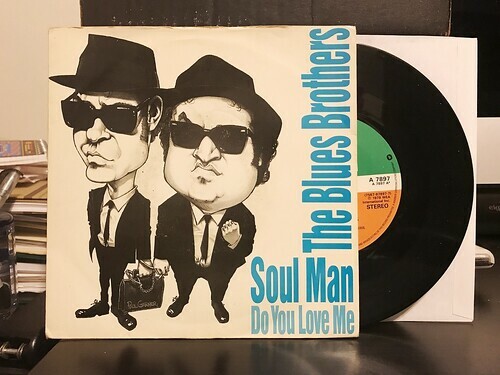 I do think it's an odd pairing with "Soul Man," but let's face it, everything about this 7" is kind of odd. I'm taking a mini vacation next week, so this will be the last post for a little bit. Things will resume on Monday, September 11th.